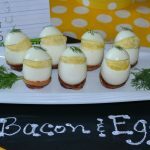 A different way to serve eggs and bacon. Hard boil eggs stand vertically with 1/3 of the egg sliced off and filled with deviled egg filling and topped with the third of the egg slice, the egg sits in a pre baked bacon cup. Perfect and fun presentation for showers, or special brunch buffets. Lightly spray back side of 2 mini muffin baking pans. Cut bacon slice in half. place or wrap bacon piece around the base of a mini muffin cup on the mini muffin pan. Cover the entire cup with bacon. Place a second mini muffin pan on top of the wrapped cups to keep bacon in the correct cup shape while baking. Place a baking sheet under the mini pans to capture any grease spillovers. Bake at 375 until bacon is crisp. Watch carefully. If necessary remove the upper pan to finish baking once the cups are formed. * the key to perfect cups are medium sliced good quality bacon. This takes some practice to get perfect cups. Make these ahead for any parties and store in refrigerator. Reheat when ready to serve. Cut 1/3 slice off top of vertical hard boiled egg, set aside. Cut small sliver off bottom of egg to stand level. Place filling in pastry or disposable bag fitted with tip #32. Pipe filling on top of the cut standing egg. Replace 1/3 slice of egg on top of the egg filling. Garnish with dill sprig. Serve bacon cups with the hard boiled eggs. .
Refrigerate leftovers immediately. Also, fill eggs right before serving. Refrigerating the filled eggs that are covered with plastic wrap will not present pretty… due to clinging of the wrap. If you don’t wrap these eggs, the filling will change and become hard. * Eggs should not be served or left out of refrigeration over 1 hour. If using on a buffet, place an ice bath under the eggs to keep cool.